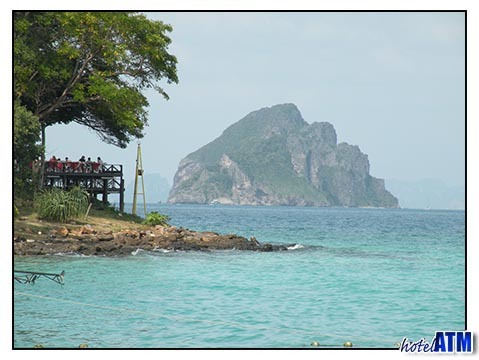 My trip to Phi Phi Island in May 2003 was in perfect weather. It had rained the day before and all the dust was removed the air. The sun was out, the views were crystal clear and went on for ever. As we left Phuket Rasada Port the cliffs of the Phang Nga Bay to the north seemed a lot closer than 35km away. As we got to Phi Phi Ley and Maya Bay I noticed how green the Island was. The last time I was there in February the jungle had browned from the fierce sun. We arrived at Phi Phi Island Cabana Hotel and all 12 of us disembarked. During the SARS out break there were few travelers to the island and it was nice to see the once sleepy village like it's old self. A rare high tide and rare southerly wind made us jump through a 30 cm surf to arrive dry and happy, once again on Phi Phi Island. Sea Breeze 1 and Sea Breeze 2 ferries, owned by Phi Phi Cabana Hotel are two of the original boats going to Phi Phi Island. Originally they departed from Krabi town for Koh Phi Phi but now they go from Phuket to Phi Phi Island at 08.30 every day. Depart 08.30 from Rasada Pier Phuket Town. Arrive Tonsai Beach Phi Phi Don Village 10.00. Cabana Has it's own private pier inform of the hotel reception. Depart 14.30 From pier in front of Hotel Reception. Arrive Rasada Pier, Phuket Town 16.00. Depart 08.30 From Rasada Pier Phuket Town. One Day Tour From Phuket goes directly to Maya Bay on Phi Phi Ley, then goes to Loh Samah before passing Viking Cave on it's way to the pier at the village. Arrive at Tonsai bay and Phi Phi Don Village 10.30. Cabana has it?s own private pier in front of the hotel reception. Arrive Rasada Pier, Phuket Town 16.00. As Cabana Hotels ferry and transport they have 3 functions. Take their in house Hotel guests to the island. Take customers to the islands from Tour Groups, Agents and the general public. Do a one day tour for guests staying in Phuket hotels.